Or not. Sorry. But to make up for it, here's Roger Ebert on a (possibly insurmountable?) problem for 3D films. [ref] Roger's been critical of newer 3D films before- mainly that the process creates a darker, blurrier picture. We're being charged more for something that looks worse. [/ref] He posts a letter from Walter Murch, a highly respected editor and sound designer. Murch says that the 3D illusion works against how your eyes perceive images. Normally, when you look at an object, say six, or sixty feet away, not only do your eyes adjust their lenses to focus on it[ref] Just like a camera lens would. [/ref], they also slightly turn inward (converge) so their line of sight matches the focal distance. Imagine a triangle, where your eyes are two points, and the object you see is the third. When you watch a movie, your eyes must converge and focus on the screen in front of you. The 3D effect allows you to focus at lots of different distances, but you also have to keep your eyes converged at the distance to the screen[ref] This is pretty much what you do with those 3D picture books- your eyes converge on the distance to the book, but focus somewhere else. [/ref]. This is an unnatural experience, requires more brainpower to process, and can induce headaches in some people. I had not heard of this problem before. I have heard of 3D movies giving people headaches. Jim Emerson wrote after watching Avatar that when a shot has a shallow depth of field (fewer planes of distance being in focus), the 3D effect makes your brain think you can focus on an object when, in fact, you can't[ref] Long lenses, which naturally produce a shallower depth of field, are used extremely often, as noted by David Bordwell when talking about Intensified Continuity. 3D would seem to favor longer takes with deep focus, which are not the norm these days. Whether filmmakers will change their practices to accommodate this remains to be seen. [/ref]. 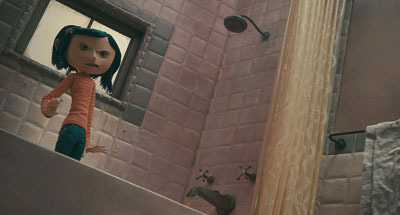 I remember getting a headache from watching Coraline, but I suspect this maybe from the sets that were designed to mess with the vanishing point than the 3D illusion. None of this particularly surprises me, not the least of which being the bandwagon of treating 3D as a breakthrough technology that will become a permanent fixture of The Future. Studios and audiences (we're all to blame) like to pretend that having cool visual effects automatically makes a movie better. John August recently answered a question on his blog from a reader who wants to make action-adventure movies. Should he spend his time pursuing a "proxy career" in commercials or music videos? John says no, but he may want to look into a VFX reel, like Ben Craig's Modern Times, because he's interested in big-budget genres that are known for their effects. I don't disagree with John- he's probably right- but I wish I could remind everyone that VFX, like 3D and CGI, are not the most important parts of a movie. As if my saying so would do anything. 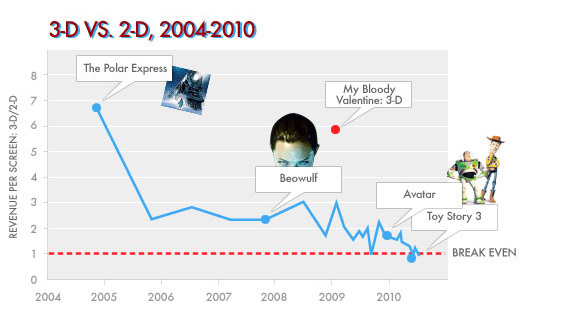 VFX are tools, to be used well or poorly. You can use a computer to make WALL-E or Delgo. What's Delgo, you ask? Exactly. Film was once a new fangled contraption itself, and that was enough to attract an audience. People have been coming to see motion pictures since before they could talk and when the computer hadn't been invented yet. People like movies, and anything else is just extra.